Simcha Ma Zeh Oseh – What Does Joy Do? In 1941, he opened the Slonimer yeshiva in Yerushalayim with five students. The yeshiva offered traditional Chassidic teachings alongside Talmudic lectures using the Lithuanian style of analysis. R. Brazovsky also could be found sitting with the students for hours on end, especially on Friday nights, teaching them the traditional Slonimer melodies. With the exception of the Yesod Ha'Avoda [the first Slonimer Rebbe], none of the Slonimer Rebbes or their predecessors, the Rebbes of Lechovitch and Kobrin, had committed their teachings to writing. 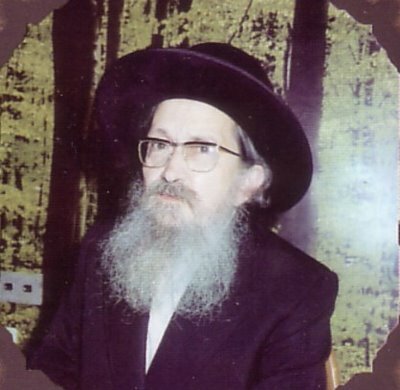 As part of his effort to rejuvenate Slonimer Chassidus, R. Brazovsky was responsible for collecting the oral traditions ascribed to these leaders in works such as Divrei Shmuel and Toras Avos (in addition to the works already mentioned). R. Brazovsky also authored many volumes of his own teachings, including the seven-volume Nesivos Shalom and many smaller works on educational issues, marital harmony and other issues. One distinguishing feature of those works is R. Brazovsky's practice of deriving practical moral and ethical teachings from verses using traditional Chassidic methods of interpretation. R. Brazovsky served as the Slonimer Rebbe from his father-in-law's death in 1981 until his own passing in the year 2000. He was succeeded by his son, R. Shmuel. In the early 1980's, a Rav whom I was close to showed a group of us a new sefer that had just been published. It was called Nesivos Shalom, by the Slonimer Rebbe. The Rav himself is quite a talented teacher and has a large following himself, but he told us how he was in awe of this sefer - that it spoke to him in the deepest way. He was kind enough to begin learning it with a group, every Shabbat morning before the Shacharit Tefilla. We were quite impressed at the Rebbe's eloquent style, and the depth of the matters that he touched on. We eagerly attended these shiurim, and reviewed the lessons on our own as well. As we progressed through the sefer, we were amazed to know that its author was a contemporary of ours, who lived in Yerushalayim, where he led a small group of Chassidim and a number of educational institutions. We thirstily longed for more - and when the next volume came out, about Shabbat and Moadim, the various festivals on the Jewish calendar, we quickly bought it and eagerly learned its contents. [Quite a few years later, more volumes came out - on the entire Chumash - portions of the Torah]. Shortly thereafter, I personally encountered a very difficult medical situation which needed spiritual guidance. I was advised to contact Rav Shach Zt"l in Bnei Brak, but being of Chassidic leanings, I was hesitant, and said I would prefer to see a Chassidic Rebbe like the Slonimer Rebbe. It wasn't long before my wife, two doctors, a Rav and myself found ourselves in the Slonimer Rebbe's office, intent on asking his advice about this very difficult situation. He patiently listened to everyone, thought it over and responded with clarity and decisiveness. He assuaged everyone's fears, and acknowledged our deepest doubts. Baruch Hashem, I made it through that situation and made a point of visiting the Rebbe again and again, to inform him and to show him my appreciation. I was always received warmly. The general principle is this: Our holy Torah is divided up into awe, love, and joy. Each of these can bring you closer to G-d. Your submission to G-d on fast-days is not dearer to Him than your joy on Shabbat and festivals…You should rejoice in the mitzva because of your love of it. You should realize the good he has bestowed on you. It is as if you were invited to the King’s table and to partake of His bounty. You will then be grateful both inwardly and outwardly. If your joy moves you to sing and dance—this is an act of divine service and one of holding close to G-d.
Song and dance on Shabbat and festivals are part of the service of these holy days. Our holy teachers have said that a person who is melancholy on Shabbos is like one who comes to the king’s palace during the king’s celebration and remains melancholy. He will not be chosen to participate in the festivities even if he is of high rank. A simple country fellow who shares the king’s joy will be chosen to participate though. The parable here is understood. When a Jew experiences inner joy, he merits to be drawn to the innermost chambers of the King. Even when a person is unable to attain the kind of joy we have described he should know that even simple joy—a joy that comes from positive thoughts—is considered acceptable and important. It is related that once on Rosh Hashana, the Baal Shem Tov would not join the congregation for the sounding of the shofar, for he was attempting to annul a severe decree and unable to do so. His disciples sat trembling with dread and anxiety. An ignorant bumpkin saw all the worry on the faces of the disciples. He went and dressed himself up as an animal in order to cheer the people up. When the people relaxed and laughed, the Baal Shem Tov emerged. He said that the only way to avert the decree was through joy but that all his worry and the anxiety of his disciples had prevented them from experiencing joy. When the bumpkin made the people laugh the decree was annulled. What does joy do? (Ecclesiastes 2). Even a superficial kind of joy can have a positive effect. The holy Rabbi of Tchortkov once instructed a disciple of his who was greatly distressed over an impending trial that could lead to the disciple’s execution. It was after the festival and the Chassidim were dancing in great joy. The rabbi instructed the disciple to join the dancers and that salvation would result. He related that once the holy Baal Shem Tov was informed on Yom Kippur that if the community would be unable to recite the blessing on seeing the moon following the holy day it would be an omen of severe decrees for the coming year. The holy day ended, the sky was filled with clouds and it poured with rain. There was no chance of seeing the moon, and all the Baal Shem Tov’s devotions were of no avail. His holy disciples knew nothing of this, and danced with great fervor as they always did following Yom Kippur. The joy exceeded all bounds; it spread throughout the town and the dancers—in their tremendous joy—asked the Baal Shem Tov to join them. When he agreed and began to dance with them the announcement came that the moon could now be seen! The Chassidim say that there are two kinds of dance: There is a dance that originates in the mind and heart and spreads to the legs and body. There is another kind of dance where a person is unable to elevate his mind and heart; he simply lifts up his legs in dance and this arousal affects his mind and heart to the extent where all his bones exclaim, Hashem! Who is like You? Intent in prayer can be aroused through singing. How much more so when singing is accompanied by dance! These two together have the power to arouse a Jew from his spiritual slumber—to awaken the sleeping and arouse the slumbering—and to attain a state of inner joy. Zechuso yagein Aleinu v'al Kol Yisrael! Today, 5 Menachem Av, is the yahrzeit of the Arizal HaKodesh, the Holy Ari who is buried in Tzfat. Rabbi Yitzchak Luria was undisputedly the greatest practitioner and expounder of Kabbala since Rabbi Shimon bar Yochai, author of the Zohar. Rabbi Yitzchak Luria founded a new school in Kabbalistic thought, known as "the system of the Ari." Rabbi Yitzchak Luria ben Shlomo Ashkenazi, whose father was related to the famous Maharshal, was born in the Old City of Jerusalem in 5294 (1534) in what is now the Old Yishuv Court Museum, and passed away on the 5th of Av 5332 (1572 CE). 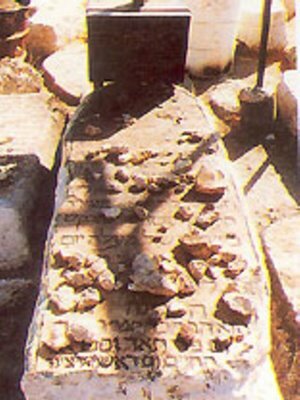 He is buried in the Old Cemetery of Safed, where tens of thousands make the pilgrimage to his graveside every year. Rabbi Yitzchak Luria is commonly known as the Ari, an acronym standing for Elo-ki Rabbi Yitzchak, the G-dly Rabbi Isaac. No other master or sage ever had this extra letter aleph, an abbreviation for Elo-ki [G--dly] prefacing his name. This was a sign of the esteem in which his contemporaries held him. Later generations, fearful that this appellation might be misunderstood, substituted Ashkenazi, his family name, for the aleph, indicating that his family had originated in Germany, as indeed it had. Alternatively, some explain that the aleph stands for Adoneinu, "our master." To this day among Kabbalists, Rabbi Yitzchak Luria is only referred to as Rabbeinu HaAri, HaAri HaKadosh (the holy Ari), the Ari (which also means "lion"), or the Arizal (the Ari, of blessed memory). The term “song” as used in the Holy Scriptures (Shir and/or Shira) refers not only to mere singing, but also to a unique type of spiritual phenomenon. A song is the manifestation of feelings into vocalized words, which represent a spiritual connection to esoteric concepts; songs reflect a belief of the intellect fused with the subconscious righteousness of the soul. Songs are especially used to commemorate happy occasions or to express one’s emotion during a joyous occasion. The core focus of a song’s content usually speaks the praises of G-d, but the actual circumstances behind the cause of the thanksgiving are also mentioned within the song. According to Lurianic Kabbalah (from the teachings of Rabbi Yitzchak "Ari HaKadosh" Luria, 1534–1572), there are eleven expressions of song—admitting/acknowledging thanks, praising, lauding, glorifying, extolling, beautifying, blessing, eternalizing His victory, exulting, and exalting. (These eleven expressions are mentioned in the Passover Haggada, at the end of the Psukei D’Zimra “Chapters of Hymns” services on Shabbos and Yom Tov, and at the concluding benediction of Hallel. Those who disagree with the Ari HaKodosh omit “eternalizing His victory”.) Conversely, song is included in the fifteen languages of praise: Song, laud, praise, music (hymns), strength, rulership, triumph, greatness, powerfulness, epitome of praise, splendor, holiness, kingship, blessings, and acknowledgments of thanksgiving. (These fifteen expressions are mentioned daily in the Yishtabach prayer) Thus, song is an expression of praise, and praise is an expression of song; this is because the raison d’etre of song is to be used as a means of expressing praise to the Almighty. Although the Israeli Home Front Command had asked that the public refrain from coming to Tzfas today for the Arizal’s yahrzeit, hundreds of determined people visited his kever [gravesite] throughout the night last night. Among the visitors were R. Elazar Koenig, spiritual leader of the Breslov Chassidim in Tzfas, and the Makover Rebbe, who lives in Kiryat Atta [near Haifa]. 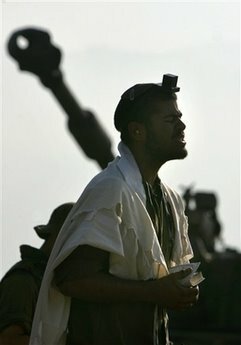 There were prayers on behalf of the inhabitants of Northern Israel, as well as for the success and protection of the forces engaged in the current war. Because of the Home Front Command’s request, no arrangements were made for the visitors; but after many people came nonetheless, lighting around the gravesite was arranged. A friend of mine in Tzfas writes: The Yahrzeit of the Arizal is today. Some people are coming into town to walk down to the Tzfas cemetery and pray at his kever [grave]. I imagine a large number of the locals will be there throughout the day. Breslov had their annual big seuda [meal] in honor of the Arizal, at 7 a.m. this morning. Zechuso yagein Aleinu – may the Arizal’s merit protect the inhabitants of Tzfas, the North, and all of the Jewish People! With close to one million of our brethren in the North of Israel are in or near bomb shelters, Arutz-7 and Chanan Morrison* saw it fit to post the following story about HaRav Avraham Yitzchak HaKohen Kook, who had to spend several of the war years of World War One in London. I have added my own emphasis to parts of this story, to demonstrate its connection to this blog. The first-ever aerial bombardment of civilians took place on January 19, 1915, when German Zeppelins dropped 24 high-explosive bombs over several English towns. Over the next three years, the Germans would drop 5,800 bombs over England, killing 557 people and injuring 1,358. Rabbi Avraham Yitzchak HaKohen Kook spent several of the war years in London, when he was unable to return to Eretz Yisrael due to the outbreak of World War I. He temporarily accepted a position as rabbi of the Machzikei HaDas synagogue of London. His private secretary, Rabbi Shimon Glitzenstein, recorded his experiences with Rabbi Kook in a booklet called Mazkir HaRav, including the following description of a sleepless night in a London bomb shelter. During the aerial bombardment over London during the First World War, the residents of the city chose various shelters. The Jews who lived near Rav Kook took shelter in the cellar of the Machzikei HaDas synagogue. Against his will, Rav Kook would also go there, but only to alleviate the fears of his family. The cellar was crowded and suffocating; the children wailed and the mothers complained. 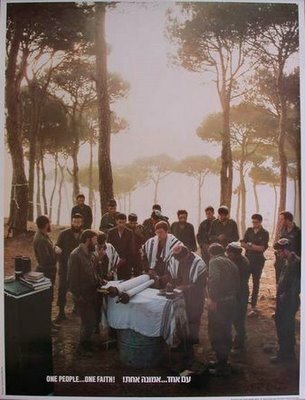 Some of the men gathered around Rav Kook and began reciting psalms together. As the noise and explosions increased, they stopped saying psalms. Those musically-inclined began to sing loudly in order to drown out the terrifying sounds from outside. Some people protested, but the Rav encouraged the singers to sing even more loudly. After several hours of a long, sleepless night in the shelter, most people had fallen asleep. Only Rav Kook remained calmly in his spot, without a sign of fatigue or distress. 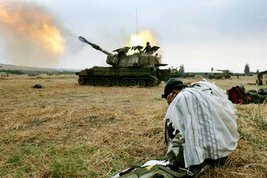 In his hand he held his small Tanach (Bible), and he recited chapter 43 of Tehillim, which opens with the request: "Judge me, G-d, and fight on my behalf against a merciless nation." I was accustomed to the Rav's recital of psalms when he was alone in his room. He would say them loudly, with bitter weeping and an outpouring of the soul. This recital of psalms, however, was much different. I did not listen to the words, which were said quietly, but to the unique melody which accompanied them. The tune was full of soul, permeated with a spiritual sweetness. The Rav was completely focused on his recitation. Even when it was announced that the danger had passed, he remained oblivious to the commotion of those gathered there, and continued reciting the chapter to the end. Friends, now more than ever, we here in Israel need your prayers. Whether it's one psalm, or the entire Sefer Tehillim [Book of Psalms], or a simple prayer in your own words, please take a little time to do so. The prayers of a Jew from a sincere heart never go unheeded! 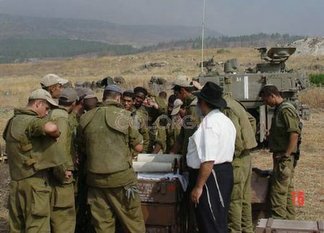 Hope you will enjoy this pictorial essay, scenes from the war front in Lebanon that SING with our faith in Hashem [G-d]. B: Isn't it usually after 9 Av? yitz: Yes, but this year they decided to make it BEFORE the Three Weeks. It just finished...let's hear good news! B: Good timing! They didn't want/need the bein hazmanim crowd? In another providential development, the three-day klezmer music festival, which saw Tzfat packed with tens of thousands of visitors, also came to a close less than 40 hours prior to the attack. I might just add that not only did the Festival finish before any bombing began, but who knows how long the present war will last, perhaps it will still be with us after Tisha B'Av, Hashem yerachem [May Hashem have mercy upon us]! SO, to top things off, Arutz Sheva has a wonderful pictorial recap of the Klezmer Festival, with audio links as well. [I've only linked to the first hour, there are more links on the Arutz 7 page]. 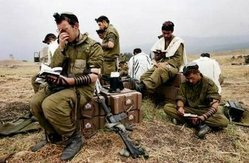 May we all have a peaceful and restful Shabbos; may our fellow Jews in the North and South of Eretz Yisrael be safe and sound; and may ALL of our Chayalim [soldiers] ALL return safely home -- as soon as possible! Acheinu Beis Yisrael, Hanesunim b'tzara ub'shivya...HaMakom yerachem aleichem, v'yoshi'eim* v'hotzi'eim...m'shibud l'Geula...Amen! May our fellow Jewish Brethren, who are in distress and captivity, May the One Above have Mercy upon them, and redeem and take them out of their subjugation to Redemption, Amen! 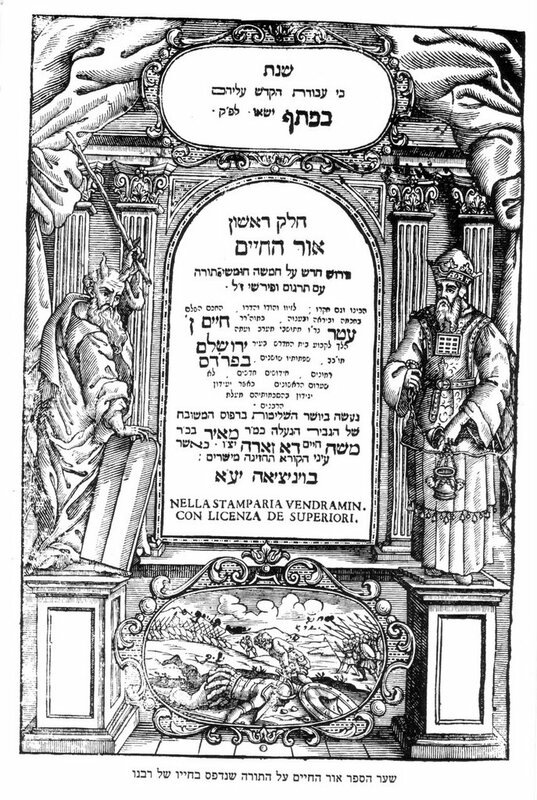 Title page of a first printing of the sefer Ohr HaChaim, 5502-1742. [Click to enlarge]. Today is the 15th of Tamuz, and the yahrzeit of Rabbi Chaim ibn [ben] Atar, known as the Ohr HaChaim HaKadosh. Rabbi Chaim ben Atar was a Torah commentator, Kabbalist, and Talmudist. His sefer Ohr HaChaim is a famous commentary on the Torah, which merited to be included together with the commentaries of the Rishonim like Rashi, ibn Ezra, and the Ramban, in the Mikraos Gedolos. Rav Chaim came into prominence in the mid-eighteenth century, at around the same time as the Baal Shem Tov and the Chassidic movement. The Baal Shem found a kindred soul in the Ohr HaChaim, in terms of their outlook and method – like “two prophets who prophesied in the same style.” When the Baal Shem Tov received a copy of the sefer Ohr HaChaim, he cherished it, and recommended it to all of his talmidim. Indeed, in addition to the Sephardim, Chassidim of all the various groups learn it regularly [see also below]. So close is the Ohr HaChaim's train of thought to those of Chassidim, that a Rav with whom I am privileged to learn the sefer Ohr HaChaim refers to him as the "Galicianer from Morocco." Rav Chaim's dream was to go to Eretz Yisrael. After receiving spiritual signs approving his desire, he went on his way. He stopped over in Livorno (Italy), where he raised large sums of money for publishing his books and establishing a yeshiva in Eretz Yisrael. With thirty followers he arrived in Eretz Yisrael, four days before Rosh Hashana 5502 (1742) and settled in Acco. Rav Chaim and his students spent Yom Kippur in the cave of Eliyahu HaNavi [Elijah the Prophet] on Mount Carmel (Haifa), where they all felt a great sense of holiness and witnessed seeing a great light at the spot where according to tradition Eliyahu used to pray. The holiday of Purim was spent in Tzfas and Meron, where a great deal of time was spent studying the holy Zohar. They later moved to live in Peki'in for a few months. On the 15th of Elul 5402 (1742), Rav Chaim finally arrived in Jerusalem with his group. He immediately established a yeshiva called Knesset Yisrael and a second secretive yeshiva for the study of Kabbalah. One of his new students was Rabbi Chaim Yosef David Azulai (the Chida), who at that time was only 18 years old. Rav Chaim and his students were constantly going on many journeys around the Land of Israel visiting gravesites of the tzaddikim. They used the opportunity to pray for the welfare of Jews all over the world, the success of their yeshiva and its financial supporters. A story is told of the “Ohr HaChaim”, Rabbi Chaim ben Atar (1696-1743), who had a beloved disciple who was very poor. The rabbi wrote a note on parchment and told his student to place it between the stones of the Western Wall. On his way to the Wall, a great wind blew his hat off his head. However, he refused to fetch it, for fear of dropping the parchment. Then the wind blew off his kippa. Having no choice but to fetch it, as he stretched for the kippa, the wind blew the note from his hand. When he told the rabbi what happened, the Ohr HaChaim took it as a sign of Heavenly decree and decided not to write another note. Later, a rolled parchment was found blowing through the streets of Jerusalem, addressing the Divine Presence on behalf of a poor Torah scholar, and signed Chaim ben Atar (Ta’amei HaMinhagim, p. 270). [In] the kvittel (personal petition) that the Ohr HaChaim had sent to be placed in the cracks of the Kosel (the Western Wall), he addresses the Shechina with the words of Shlomo HaMelech: “My sister, my beloved, my dove, my perfect one” (Shir HaShirim 5:2). The most famous of Rabbi Chaim's works is Ohr HaChaim, a commentary on the Torah. In this work he employs the four methods of exegesis: pshat - explaining the simple meaning; drash -homiletic interpretation; remez - allusion; and sod - the Kabbalistic esoteric approach. This book was enthusiastically accepted by Sephardic and Ashkenazic rabbis alike. His book Chefetz Hashem was his first book, it was a commentary on tractates Shabbos, Horayos and Chullin. His second book was Pri Toar, a commentary on Yoreh De'ah (one of the sections of Shulchan Aruch). Rishon Letzion was a book he wrote when living in Jerusalem. It is a commentary on Prophets and Writings (Nach) and a few tractates of the Talmud. His answer is that Shlomo HaMelech wrote this for the time when the Jewish People would be in exile. He used a mashal, a parable, of Hashem as the king, and the Jewish People as the queen. The king had banished the queen, and the neighbors thought that he was finished with her – that he would never see her again, and she was gone from the thoughts of his heart and mind. However, a prince [who was a child of the king and queen] visited his father, and discovered that he still loved the queen. And upon visiting his mother, he found that she still loved the king. He then authored a song about the king’s love for the queen, and another song about the queen’s love for the king, based on this knowledge. Thus, “Shir HaShirim” can be explained to mean a Song composed of Songs - two songs. One, that of Hashem’s love for Knesses Yisrael [the Jewish People], and the other, that which the Jewish People sings to her beloved, G-d. The founder of the Chassidic movement, The Baal Shem Tov, maintained that if he could join forces with Rabbi Chaim, together they could bring Moshiach [the Messiah]. The Baal Shem Tov made several failed attempts to reach the Holy Land. In fact the Baal Shem Tov believed that Rav Chaim was the Moshiach of that generation. On the day that Rav Chaim came to Jerusalem, The Baal Shem Tov told his students: "Today Moshiach ben Yosef entered Yerushalayim". Rav Chaim departed the world at the time of Mincha of Shabbos Parshas Pinchas. At that exact moment the Baal Shem Tov was eating the third meal of Shabbos and uttered: "The western candle has been extinguished." After Shabbos he explained: "The tzaddik in the west, Rav Chaim ben Atar left the world. The proof for that is: there is one secret about the washing of the hands (netilat yadayim) which is revealed to only one person in each generation. This secret was known to Rav Chaim. When I washed my hands for the third meal, that secret was revealed to me, and that was my sign that the "western candle' was extinguished." Rabbi Chaim ben Atar was 47 when he departed the world. He was buried outside the walls of the Old City of Jerusalem, on Har HaZeisim [the Mount of Olives]. Before the Six-Day War in 1967, the Jordanians had control over the cemetery where Rav Chaim was buried, where they destroyed many tombstones and paved a new road. When the tractor touched the gravesite of Rav Chaim, it turned upside down and the driver was killed. They tried a second time, and again the tractor turned upside down and the driver was killed. Someone tried to use a hammer, it turned on himself and he was killed too. The gravesite was left intact. 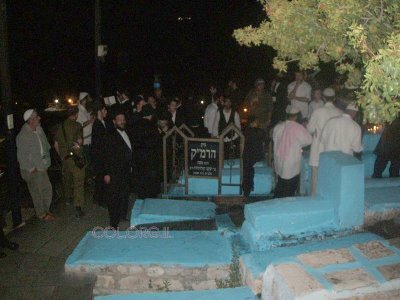 To this day, hundreds if not thousands visit his Kever on his yahrzeit. Zechuso yagein Aleinu, v'al kol Yisrael - May Rabbi Chaim ibn Atar's merit protect us all! UPDATES: 1. There were literally thousands at the Tzion [gravesite] yesterday. I went for Mincha-Ma'ariv [around sunset], and hundreds were still arriving. Egged ran buses until 9:30 pm at night! 2. For another wonderful Ohr HaChaim story, see this one at Ascent's website. CARLEBACH @ KLEZMER @ TZFAS! Yes, I'm still here, although I've been a bit busy with the new Modzitz-Yahoo website. 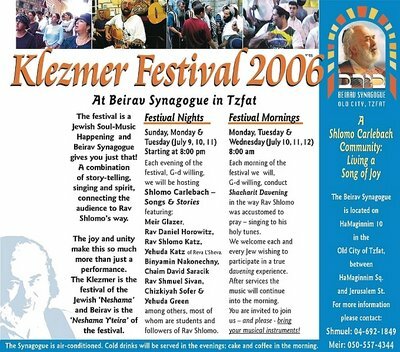 This coming week – Sunday through Wednesday, is the annual Klezmer Festival in Tzfas, Northern Israel. The festival has evolved from pure Klezmer music, to an array of some of the best musicians from Israel and abroad. The Klezmer performers include Musa Berlin, Giora Feidman, Yisrael Zohar, Bernie Marinbach, and Chanan Bar-Sela. Among the other musicians are [of course] Simply Tzfat, Aharon Razel, Adi Ran, Sinai Tor, Shlomo Gronich and Rav Yehuda Wasserman. 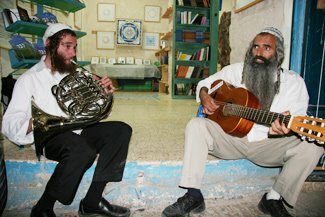 For all my holy neighbors in Eretz Yisrael, enjoy the music! Here’s the English schedule for Klezmer Festival. Only the graphics header is in Hebrew. To print it, set your printer to landscape because it is too wide to fit on A4 [or Letter] paper. Am Yisrael needs some soothing for our newest pain. May the music be balm for our wounded nefesh [soul]. But for me, the highlight of the festival is the non-stop Carlebach music at the Beirav Shul [or e-mail], in the Old City of Tzfas.